The Three Peaks Challenge is a serious challenge event that will provide some amazing memories, it is also great for team building and/or fundraising. Regarded as one of the UK's most challenging team events, this challenge provides the individual and team with one of the ultimate tests of physical endurance and mental stamina. It is a non-technical mountain challenge that is both tough and physically demanding and ideally preparation training should start 2 to 3 months prior to the event - subject to the individual's basic level of fitness. However, with the correct preparation this challenge is achievable for anyone in a healthy physical condition with thorough advance preparation and the right mental attitude. Backed up by a professional support team with qualified outdoor instructors our aim is for you to safely complete the National Three Peaks Challenge within a 24 hour period. We provide full support for your challenge and have various ascent/descent routes based on the ability of the group. We also offer alternative routing options: north to south or south to north itineraries which are designed in accordance with the needs of each group and their geographical location. This is a serious event that involves challenging walking and sleep deprivation but it will provide some amazing memories that will surely last a lifetime! 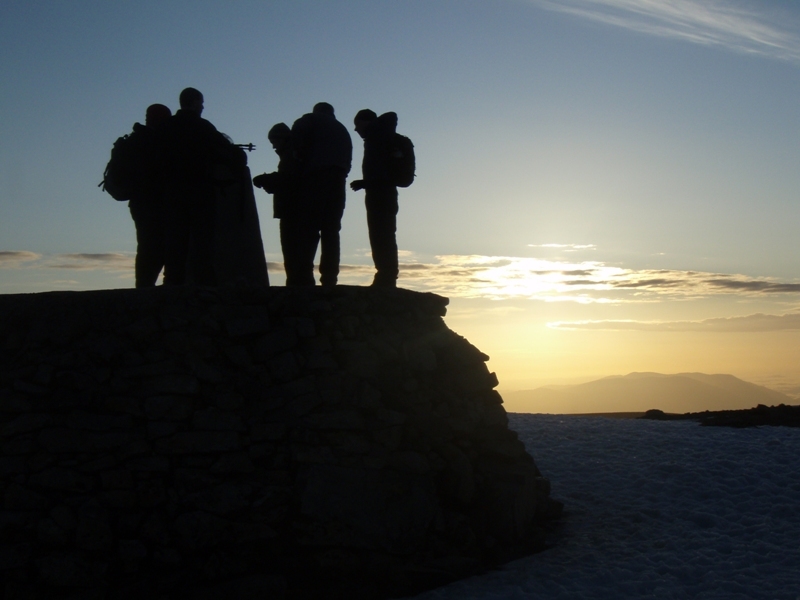 The Three Peaks is great for team building and/or fundraising. Meet the Activus crew at Warrington Bank Quay Railway Station at 4.15pm. Travel down to your hostel accommodation in Wales and receive a briefing about the challenge ahead. Then get settled, have your 3 course evening meal and pack your daysacks ready for an early start the next morning. Wake up before 6am and have an early continental breakfast before grabbing your gear and food and drink for the first peak and heading off up Snowdon. This should take no more than 4 hours so you'll be on the road again well before midday and should arrive up at Wasdale by 4pm that afternoon. Collect what food and drink you need and then set off up Scafell Pike over Lingmell Col or Mickledore. After 4 hours you'll be back in the car park and climbing into the minibus ready for the final leg of driving. Try and get some sleep during the drive! Around 1.30am arrive at Glen Nevis and set off up Ben Nevis. Target time for this peak is 6 hours so if you've done well on the first two you'll have no problem completing the challenge successfully. Once its over you'll head off to take a shower nearby and then tuck into a hearty full english before receiving a de-brief and departing for the airport. Price is based on our standard package for group size 8. However, we can provide specific costings for tailor-made events on receipt of your booking request. Discount is available for larger groups. Availability can be arranged outside of the dates listed. Please contact us if the dates listed do not suit your needs. I still can't quite believe I did it. I ended up having a solitary weep at the bottom of Ben Nevis because I just wanted to stop walking and the weather was so beautiful then and everyone was taking their time up it & i wanted to do the same. But saying that it was the sole time I was down throughout the event, even at the top of Ben Nevis where it was what I imagine purgatory to be: freezing winds, wet and giant stones looming out at you! Please pass on my thanks to Tony and the guides Faye, Craig and Matt - particularly Craig who was a little lumbered with me. How great they were: professional, positive and good company. Just wanted to drop you a quick mail about the peaks and thank you for a fab adventure. There was plenty of food, the accommodation and transportation were perfect, and guides amazing!! I had a great time over the weekend and thank you all for your hard work and for making the challenge so enjoyable. In May 2008 I arranged a National Three Peaks Challenge with KLM Travel. It was an excellent experience for us all and we still talk about it and how enjoyable it was even now. Tony's dedication to detail combined with a personal touch is second to none and I thank him for his assistance throughout. On a personal front it was a truly life changing experience. It made me realize that with a busy work commitment I was not taking care of myself as much as I should. As a result of the challenge I am now three stone lighter and have just taken part in another major challenge. Health wise I have never been fitter. I owe all this to Tony Holliday and Activus Outdoors. I just wanted to give you some feedback for the mountain guides you provided for us. What a lovely group of people each and every one of them. They were professional but also made the climbs good fun and the whole group were of the same opinion. Would you kindly pass on our thanks to all of them. I know our group were a little slow which may have been frustrating for the guides who are probably used to speedier teams, but at no time was the team made to feel inadequate in any shape or form. All the girls loved Blake! So thanks Tony, we would not hesitate to use your company again. Just to say thank you very much for everything last week. Linc and I thoroughly enjoyed being part of the challenge. We received the CD you sent and have enjoyed re-living it .... what wonderful views!! We have nothing but praise for Geoff, Dave, Mike and yourself. All 3 guides were absolutely superb, very knowledgeable, friendly and made the whole experience a great one. I would definately recommend your company for anyone thinking about doing the 3 Peaks. I thoroughly enjoyed myself over the weekend, and a large part of that was due to Tony and his team's excellent organisational skills and leadership. Iâ? ?d like to take the opportunity to thank you and your team for facilitating our 3 Peaks Challenge. The whole group felt this was a very positive experience and are pleased with their achievement. I completed the Three Peaks Challenge with the aid of your guides Rob and Mike who were both very competent and professional throughout the challenge. Both offered sensible advice and motivation and showed patience in dealing with the severely under-trained among our group. It was an amazing weekend that none of us will ever forget. Tony and John provided a great service not just throughout the weekend but from the very outset with their expertise and advice to ensure that we had a successful and enjoyable challenge. Highly recommended. Tony and his team led an excellent Three Peaks challenge for us in the summer of 2008. From start to finish they made the trip a truly memorable one. Tony's knowledge and preparation were evident throughout. Our meals, accommodation, transportation and gear were all perfectly executed and hassle free. Equally impressive (and important) to the logistics, however, was Tony's clear enthusiasm. He motivated us all and kept us in good spirits through rain and exhaustion - no small feat during a 24 hour challenge. It was refreshing to see someone so engaged in their work. I would definitely recommend Activus Outdoors to any interested group and hope I'll have the chance to participate in one of their trips again. I think we all thoroughly enjoyed the experience and I hope that you have received similar positive feedback from the other participants. Please can you pass on my thanks to all your colleagues for making the event so memorable. Pulling all the arrangements together is no mean feat and I think the logistics in supporting this event were superb. As with all these types of activities it is the people you meet that really makes the event and so please can you pass on a special thanks to the guides and drivers who made the whole experience so enjoyable.